While the desktop-bound GeForce GTX 680 is undoubtedly the most exciting release from NVIDIA today and the true flagbearer for their new Kepler microarchitecture, NVIDIA actually has a whole host of releases ready to go on the notebook front. We've already had a chance to check out the GeForce GT 640M in action, but it's far from the only member of the old/new GeForce 600M series. Today we have details on their complete 600M series from top to bottom; some of it is exciting and new, and some of it is just the GPU industry up to its same old marketing tricks. What we're essentially looking at within the GeForce 600M series are a couple of rebrands, one brand new piece of silicon, and one die shrunk last-generation GPU. NVIDIA has assembled a motley crew with a notable absence at the top of the heap. At this point you should already be very familiar with the Fermi architecture, so the rebadges and die shrink aren't going to be that new to you; if you're not familiar, you can refresh yourself by checking out Ryan's launch article for the GeForce GTX 480 on the desktop. What you're probably really here for are details on Kepler's mobile variant. We couldn't share any details about it when we reviewed the Acer Aspire Timeline Ultra M3, and instead had to pussyfoot around what we knew of Kepler. This was made doubly difficult by the fact that NVIDIA's own Control Panel and GPU-Z didn't correctly recognize Kepler chips. For a more detailed analysis of the Kepler architecture you'll want to check out Ryan's review of the GeForce GTX 680, but there are some essential differences between Kepler and Fermi that bear repeating here. The only Kepler chip in NVIDIA's current mobile lineup is the GK107, and it sports 384 of NVIDIA's CUDA cores; architecturally it's basically a quarter of the GK104 that powers the GTX 680. That's one quarter the cores and one half the memory bus. Unfortunately it's also difficult to determine how many ROPs or TMUs are powering it, but the most recent version of GPU-Z pegs it at 16 ROPs which would theoretically work out to 64 TMUs. That seems to fall in line with our experience. Kepler also ditches the separate shader domain that's been a part of NVIDIA's GPUs for a long time; the GK107's CUDA cores all run at the same clock as the rest of the GPU, so despite having as many cores as the GTX 580M, performance won't be quite that high. What GK107 also brings to the table is NVIDIA Control Panel support for FXAA and TXAA, as well as NVIDIA's dedicated video encoding hardware NVENC. There's also DirectX 11.1 support and a notebook analog to the desktop's GPU Boost: the GK107 is able to dynamically increase its clock speed depending on the current thermal load within the notebook. We're not sure exactly how this is done, but it's essentially a GPU version of the Turbo Boost and Turbo Core technologies we've seen from Intel and AMD CPUs for some time. Finally, NVIDIA's Optimus graphics-switching technology makes its return. NVIDIA was happy to announce a series of design wins with Ivy Bridge, but while we're privy to them we unfortunately can't share any details with you right now. We'll have to wait until Intel's Ivy Bridge embargo lifts for that information. 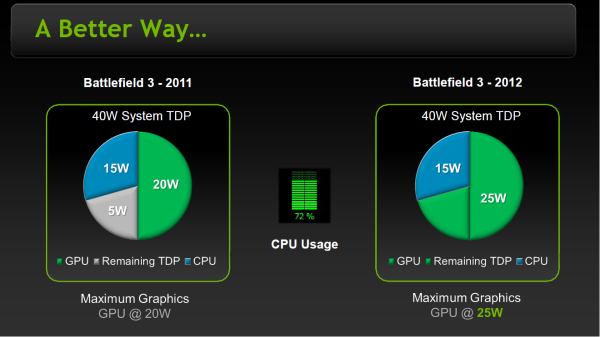 Suffice it to say, expect to see a LOT of GeForce 600M GPUs on the market once Ivy Bridge is launched. With that massive info dump out of the way, let's take a look at NVIDIA's 600M series proper. The GTX 680M, GTX 660M, GT 650M, GT 640M, GT 630M, and GT 620M are not rebadges. the mobile chip marketing is so f'ed up it's not even funny.